Posted on May 27, 2015	by Katy K.
This year’s Caldecott winner, with two honor books – many of these I had to wait for at the library because everyone wanted to read them. 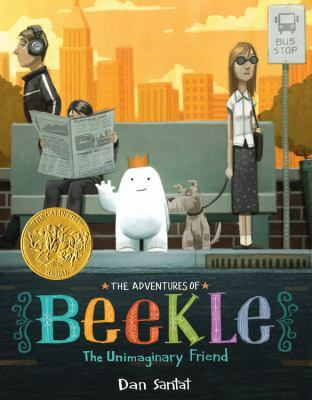 Adventures of Beekle, the Unimaginary Friend by Dan Santat. Little, Brown & Co., 2014. This is the title that won the Caldecott, and which I’d somehow missed hearing of, though I’ve enjoyed Dan Santat in the past – we own and love The Three Ninja Pigs. This one is even more charming. On an island far away, outside of reality, imaginary friends are born, and hang around waiting for a person to imagine them. Our hero, Beekle, has been waiting and waiting, watching his friends leave. Finally he decides to take matters into his own hands, journeying to the real world to find his friend himself. Things in the real world aren’t quite what he expects – but sometimes things are better that way anyway. Santat’s style has a unique quality of looking blocky and rounded at the same time. The colors are gorgeous, and Beekle and his friend as cute as can be. I wasn’t at all surprised to find this a hit with my daughter and her K/1 class. 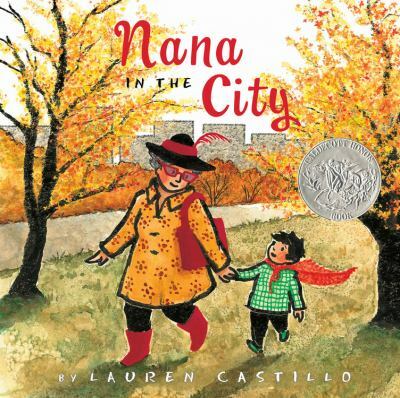 Nana in the City by Lauren Castillo. Clarion Books, 2014. A preschool-aged boy is quite upset at spending a night at his grandmother’s in the city for the first time. The city is big and scary! Grandmothers belong in safe and cozy places! But with the help of a red cape that she sews for him, he’s able to share her joy in the exuberant life of the city. As Lindsey at A is for Aging, B is for Books http://www.lindseymcdivitt.com/, points out, positive images of aging are rare and important in children’s books. Not only is our young friend reassured about the safety of life in the city for his Nana and him, but readers get to see a grandmother who’s full of creativity and zest for life. The bright ink and watercolor illustrations bring the city beautifully to life and manage to be comforting at the same time. The text seems aimed at the toddler to younger preschool crowd and didn’t grab my five-year-old as much, but it should be a hit with the target audience. 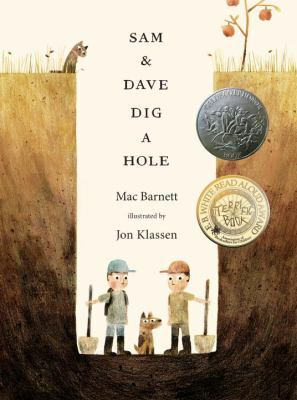 Sam and Dave Dig a Hole by Mac Barnett. Illustrated by Jon Klassen. Candlewick, 2014. It seems like everyone but me had read this book before it won the Caldecott honor. It’s simultaneously funny and frustrating: two boys dig a hole looking for treasure. Every so often, they give up and start digging in a different direction. The illustrations show a cross-section of the earth, so that readers will see that the kids are missing bigger and bigger gems each time they turn. The dog keeps sniffing at where the gems are, but the boys never find them. The story goes on, becoming stranger and more ambiguous. I was just researching his art methods –he uses lots of traditional painting and drawing techniques, sometimes cutting out painted bits and photographing them, then mixing things together digitally. It all comes together into his very recognizable style, with muted colors and crisp outlines. I didn’t quite love it, but I can see the appeal. This one feels like kids may or may not fall in love with it, but there’s enough depth and information presented only in the pictures that it bears repeated reading. This entry was posted in Books and tagged award winners, Caldecott, picture books. Bookmark the permalink.